(Nanowerk News) The strength of a chemical bond between atoms is the fundamental basis for a molecule's stability and reactivity. Tuning the strength and accessibility of the bond can dramatically change a molecule's properties. For example, a bond's strength is directly related to its length: stretching a bond beyond its normal length makes it weaker. But new research by a team from two European universities and SLAC National Accelerator Laboratory shows that attractive forces between other parts of a molecule can make a stretched bond joining two carbon atoms much more stable than expected. This result should lead to improvements in how scientists design new molecules, materials and catalysts. "We provide an understanding for why molecules with exceptionally long bonds do not necessarily have to be unstable," said Jeremy Dahl, a scientist with the Stanford Institute for Materials & Energy Science (SIMES), an institute jointly run by SLAC and Stanford University. Collaborators were Peter R. Schreiner from the Justus-Liebig University in Germany and Andrey A. Fokin from the Kiev Polytechnic Institute in the Ukraine. The results are published in Nature ("Overcoming lability of extremely long alkane carbon–carbon bonds through dispersion forces"). Though applicable to all types of molecules, the new research involves alkanes, a class of molecules composed of just carbon and hydrogen atoms connected by single covalent bonds, and diamondoids, which are molecule-sized diamonds pioneered by SIMES researchers. Ethane, propane and octane are familiar alkanes that have backbones of two, three and eight carbon atoms, respectively, all joined by single bonds. The carbon atoms in the extremely rigid diamondoids are arranged in the same tetrahedral shape as diamond. 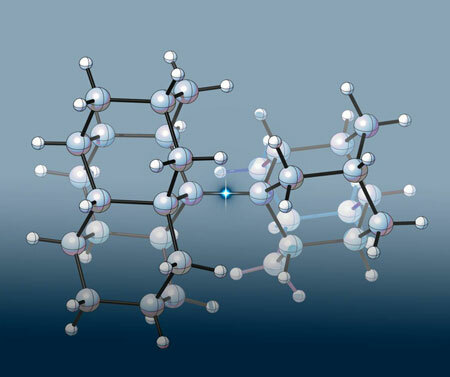 In their new research, the scientists joined pairs of diamondoids to create three new alkanes that had an ultra-long carbon-carbon bond in the middle. To accommodate the bulky diamondoids, the central bond had to stretch far beyond the normal carbon-carbon bond length of 1.54 angstroms. (An angstrom, or Å, is a tenth of a nanometer.) One of the new molecules had the longest carbon-carbon bond ever measured in an alkane: 1.704Å. Surprisingly, these new dual-diamondoid molecules turned out to be much more stable than expected. Earlier research by other groups had shown that an alkane with a 1.65Å carbon-carbon bond survived less than an hour at 167C (333F). In contrast, the central carbon-carbon bond in two of the new linked-diamondoid molecules broke apart only after being heated above 300C (572F). The third one, with the 1.704Å carbon-carbon bond, lasted until it was heated to 220C (428F). "Based on carbon-carbon bond-length alone, I expected these diamondoid molecules to be much less stable than they proved to be," Schreiner said. "Something else had to be going on that was keeping these new molecules together." What made the difference? X-ray crystal structure, nuclear magnetic resonance, and thermogravimetric studies made by Dahl's European colleagues showed that even as the bonds stretched, attractive forces between the two diamondoids were pulling them closer together. These attractive forces are usually seen between separate molecules, where they are called van der Waals forces after the Dutch physicist who first described them in 1873. "Scientists usually don't consider van der Waals attractions when analyzing the stability of a single molecule, but it now looks like they should," Dahl said. The group's research findings were supported by sophisticated computations that allowed the scientists to switch the attractive forces on and off when they evaluated the new molecules' stabilities. Schreiner added that this finding may explain why conventional analysis predicts branched alkanes – which contain large groups of atoms attached to the alkane backbone – to be much less stable than they actually are, and why diamondoids have far higher melting points than expected. These results are the latest in several interesting research findings and applications for diamondoids since Dahl and his colleague Robert Carlson developed a way of isolating significant quantities of them from crude oil in 2003. Among their interesting properties, diamondoids emit electrons extremely efficiently. In work published in Science in 2007, SIMES scientists Zhi-Xun Shen, Wanli Yang and Nick Melosh – in addition to Dahl, Carlson and the Schreiner Group – showed that diamondoids readily emit electrons over a very narrow energy range, a property that could improve the imaging capabilities of several types of electron microscopes as well as electron-beam patterning used to make computer chips. Diamondoids are also highly customizable, meaning different varieties can be produced and modified to meet different specifications: three-dimensional crystals for applications requiring a powdered material, two-dimensional films for coating other materials, and possibly even one-dimensional nanowires for transferring charge or light. "These latest results show that making molecules in new shapes and sizes can lead to surprising discoveries," Dahl said.